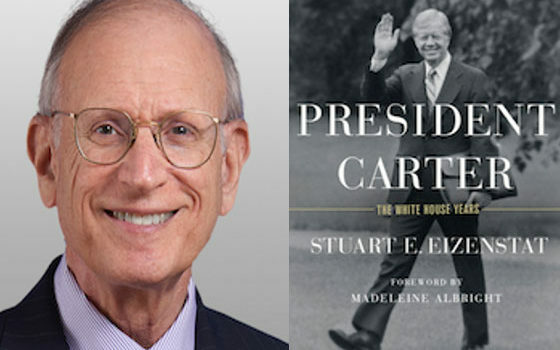 Stuart Eizenstat, author of President Carter: The White House Years & Carter’s Chief Domestic Policy Adviser, talked with me about President Jimmy Carter. Was Carter an ineffective, overwhelmed outsider who oversaw four of the worst years in our history, or one of the most consequential presidents in modern history? Forget everything you think you know about President Jimmy Carter and get ready to ask yourself, “Was he an ineffective, overwhelmed outsider who oversaw four of the worst years in our history?” Or as my guest today argues, was Carter’s presidency one of the most consequential in modern history? I confess, I forgot just how much occurred during Carter’s four years and how much of what he did then set the stage for politics and policies today. Ideas like, protecting the environment, putting human rights at the center of foreign policy, energy conservation, the Middle East peace process and perhaps most painful in today’s political ridiculousness, a post-Watergate president who ran for office on the promise that, “I’ll never lie the American people.” Say what you want about Carter, he kept that promise. But for all the success, Carter’s presidency is rarely hailed. He micromanaged. He tried to do too much. He ruined the economy. He oversaw gas lines in America. Literally, lines of people in cars waiting to fill their gas tanks, Google it. And most terribly he couldn’t free the American hostages from 444 days of captivity in Iran. So how should we consider Jimmy Carter’s presidency? More on Stu. Before the Carter years, he had worked as a very young man in the LBJ administration. After Carter he served as US Ambassador to the European Union and then Deputy Secretary of the Treasury under Bill Clinton. He’s been a powerful presence internationally and was awarded high civilian honors from the governments of France, the Legion of Honor, Germany, Austria and Belgium as well as from Secretary of State, Warren Christopher, Secretary of State Madeline Albright and Secretary of the Treasury Lawrence Summers. He now heads the International Practice at Covington and Burling. Stu’s exceptional book gives insight and context to every crisis and challenge of the 1970s. We talked about many of them and most relevant for today, I asked him about how much of what Carter is being attacked by Trump and Trump’s own approach to the presidency. Chris Riback: Stu, thanks for joining me. I appreciate your time. Stuart Eizenstat: Chris, thank you for having me. Chris Riback: Let’s start with your headline which I imagine will make some folks curious and may even make other shake their heads but here we go. You write that, “Jimmy Carter’s presidency was one of the consequential in modern history.” Why do you say that? Stuart Eizenstat: You know his political idol Chris, was Harry Truman and he placed Truman’s favorite slogan on his desk, “The buck stops here.” Both left the White House as widely unpopular presidents but Truman is now recognized more for his achievements than his faults and I hope my book will contribute to a similar reassessment of Carter as president, not just as the most admired former president. And the reason I say that is that I do not ignore and I think the credibility of the book is based on the fact that I do not ignore the very real problems we had which can discuss shortly. But, those have obscured the enormous successes, both domestic and foreign and let me very briefly summarize them. Stuart Eizenstat: He lay the foundation of the energy security that we enjoy today by three major energy bills in four years which deregulated the price of natural gas and crude oil and therefore encouraged maximum production. He placed conservation at the center of the nation’s agenda for the first time on energy and he ushered in the new era of clean energy with solar and wind power. He was a great consumer champion. He appointed consumer advocates, not industry stalwarts, to regulate industries and gave them a charge which he backed up with legislation. And that was to transform our whole transportation system. He deregulated trucking, railroads and airlines and really brought air travel to the middle class. Allowed competition for prices and new entrants like Southwest and Jet Blue which might not exist as we know them today. And he began the deregulation of telecommunications, ushering in the cable era. Of banking and even Chris, with beer, reversing prohibition era regulations which had blocked the flow of local craft beers. He was the greatest environmental president since Theodore Roosevelt, doubling the size of the national park system through the Alaska Lands bill in a very, very tough fight. He followed through on his post-Watergate pledge for good government with major ethics legislation requiring disclosure of assets and employment going into office, limiting gifts while you’re in office, limiting the revolving door after you leave. He, in the area of good government, passed the Inspector General law which put Inspector General to root out, fraud, waste and abuse in every agency. Those still very much exist. And in addition, he had merit appointments for all judges. He created the Office of Special Counsel to investigate wrongdoing. Passed the foreign crop practices act. All of these brought a whole freshness and ethics to government. He and Mondale created the modern vice presidency out of an institution which was held in complete disrepute. He brought Mondale into all meetings, access to all secret documents and importantly for the first time brought the vice president’s office into the West Wing just steps away from the Oval Office. And even on inflation, which rightly people associate with him as a negative. After trying everything possible and having inflation go into the stratosphere from the second oil shock of the 1970s, Nixon had the same problems. He appointed Paul Volcker knowing, because Volcker told him that he was going to choke the economy, squeeze inflation out. And that would mean higher unemployment, higher interest rates in the middle of a reelection campaign but he told all of us, he said, “Look, I’m going to do this regardless of my election consequences because I don’t want my legacy in this area to be permanent high inflation.” And unfortunately the lower inflation didn’t come until he left office. It benefited Reagan and the nation today. In foreign policy, his accomplishments were also stunning. The Camp David accords and the Egypt Israel peace treaty remain 40 years hence. The centerpiece of Israel’s security. The first peace treaty between Israel and its Arab neighbor. He applied human rights as a centerpiece of his foreign policy, applying it to both military dictators and Latin America and to the Soviet Union reaching out to the Soviet Jewish movement. Reaching out to the Democratic dissident movement of Sakharov, saving Sharansky’s life by saying he wasn’t a spy in the middle of his trial. Passing the Panama canal treaty which was one of the bloodiest fights we had, Chris, and led to a new era in US Latin American relations. It was he, not Nixon and Kissinger who actually normalized relations and took on with China and took on the Taiwan lobby. So all of these are enormously important and they’ve all been obscured by the problems he had. Chris Riback: It’s an incredible list and yes, one of my first questions that I have written down for you is, I was just so struck by how much happened. You captured in the four years of the presidency and of course your book covers even more than that including your first meetings with Carter back in 1969 when he was I guess thinking about his first run for governor and I would love to ask you about that as well. But I was so, so much happened and so yes, you just outlined and outlined all of those things in terms of accomplishments. Stuart Eizenstat: By the way the book is not just a dry recitation of these. It’s got anecdotes and stories about how it happened. Humorous stories. I profile people in a very real way. They could come out of a Shakespearean play from villainous to heroic. Stuart Eizenstat: I felt like as we say in the south, I was really high cotton. I knew I had made it when John Denver came in to talk about solar energy. Chris Riback: Yes, he was selling you on him and Robert Redford, that they would go and help you sell that solar energy. No, no, look at, I know the book has incredible tales. It brings you, it’s not a light book. You cover the territory which also made me think so much happened and Carter and you and the team tackled so much, those were and you just outlined the wins. Did that contribute to the problems? Did that contribute, was there so much going on, did that contribute to what you would characterize as Carter’s weaknesses? Or what you characterized as his weaknesses were there, they are part of him and whether he had one thing on his plate or 25 on his plate, they would have come out? Chris Riback: Go deeper on that point though for me if you would. Because it’s not a matter of discipline. You talk about his time in the Navy, and you talk about the way that the head of the nuclear submarine, Admiral Rickover, how he connected with Jimmy Carter and saw the potential in Jimmy Carter when he was in the Navy. It’s not a question of discipline, I wouldn’t think, with Jimmy Carter. He ran his family farm and yet you just outline putting forth so many different things. Not having the Chief of Staff at a time when many folks thought that’d be Jack Watson or later it became Hamilton Jordan. Why didn’t he overcome those? Is it a self awareness? What was the why behind what drove those problems? Stuart Eizenstat: He brought with him the fact that in Georgia when he as governor the legislature Chris, meets only 40 days. You have to get everything done quickly if anything’s going to be done. And didn’t sort of transfer his thinking into a very different Washington reality. And that’s why he needed to have as Reagan did when he came in and brought in Jim Baker as Chief of Staff, he didn’t have the kind of experienced staff initially that could help him sort things out. So he was very disciplined when it came to individual decisions, reading reams of material. If anything he was blamed for being too immersed in detail although when one looks at how people are making decisions now, by three by five cards or tweets, that’s not so bad. So he was disciplined with individual decisions but it was making the connection of dots. If I take on the water projects at the beginning which he did, which angered a lot of the southern Democrats, is this going to impact, as it did on my getting my energy bill done? It’s making those kinds of connections that require a political sophistication of Washington that didn’t exist. There also, Chris, I think it’s very important that you know and I think you’re sophisticated listeners, let’s look at the era in which he governed in the 1970s because it was a period of epic change. The whole centrist political consensus of the post World War II era had began to unravel under the pressures of the loss in Vietnam, urban violence and persistent high inflation. We didn’t invent inflation it was high throughout the Nixon and Ford administrations as well. There was a rise in this one short decade and particularly during Carter’s period of a consumer movement, the environmental movement, the black power movement, the women’s rights movement, the pro-life movement after Roe v. Wade. The ascendancy of the conservative evangelical movement led by Jerry Falwell who contended that Carter, the most religious president in modern times was not a real Baptist and was harboring homosexual on his staff. And Reagan was able to bring together in 1980, Nixon’s so called silent majority, of sort of frustrated blue collar workers and tether it to these evangelicals to form a coalition that powers the Trump base even today. Chris Riback: Do you remember your first meeting with him? 1969. Chris Riback: What stands out? Stuart Eizenstat: I had just come back from working for Lyndon Johnson in the White House after I graduated from Harvard Law School and then working as the research director for Hubert Humphrey’s presidential campaign. And after he lost to Nixon in 68, I went back to Atlanta where I grew up and I went, I made a beeline to the office of former governor, Carl Sanders who was going to be running for election again under Georgia law you couldn’t have consecutive terms. He was the odds on favorite Chris. He’d been a moderate governor. He had tremendous amounts of financial backing and I saw him in his very sumptuous law office, told him I was a hometown boy, had been all-American at Grady High School. Phi Beta Kappa at UNC, Harvard Law School, worked in the White House, et cetera, et cetera. And he was only mildly interested. He had such support already. So a friend of mine from high school, Henry Bower Junior, kept talking to me about Jimmy Carter. And he had run in 66 when I was in law school and lost as governor but he had attracted a lot of support. And he pestered me to such an extent that I met him in the old Hurt Building across from the federal courthouse where I was clerking for a federal judge. And we met Chris, in a bare bones office that was a stark contrast from the sumptuous law office of Carl Sanders. It had a folding chair, a folding table and two steel folding chairs. But what impressed me was the following. Here was a very handsome, articulate person from southwest Georgia, tiny hamlet, but he understood Chris, urban problems. And historically in Georgia was a great divide between the rural part of the state and Atlanta. He supported mass transit, he supported education and importantly for me, he had a very strong commitment to civil rights. And indeed one of the things that propelled him to the nation’s attention was when he gave his inaugural speech as governor and said, “The time for discrimination is over.” He put Martin Luther King’s painting in the capital in Atlanta. These were things, but initially when we had that first meeting, I was impressed but I still, I had committed to Sanders. He called me up, said, “I want to see you again. I really need you.” And he told he wanted me to head his policy shop for the campaign. And I knew then that I was hooked. He simply was so much of a fresh face. So articulate. I called Sanders and explained that I couldn’t work for him, I’m sure he didn’t give it a second’s thought. And in terms of my relationship with Carter, the rest is history. I became his policy director as governor, his policy director in the 76 campaign and his domestic advisor in the White House. But not just a domestic advisor, I was involved in a whole raft of foreign policy issues. The Middle East, dealings with the Soviet Union and China, sanctions, policies and the like. Chris Riback: When you were talking earlier about the list of things that Carter attacked and accomplished, one of them, a lot of it had to do with modernization was one of the themes that I took away. Modernizing a view of the environment. Modernizing our take on energy. And yes, as you point out, many of his reforms and conservation and the things that he advocated we’re reaping benefits from those today. Modernizing the role of the vice president. Reading how you described Mondale’s role. Any of us who have read Caro’s books and see how LBJ for example was handled under Kennedy. That was a total change what Carter did with the vice president. Stuart Eizenstat: Or how Johnson handled Humphrey. Chris Riback: Yes, well once you’ve been hazed yourself I guess you pass on the hazing. But absolutely. I guess you saw that first hand. You were on Humphrey’s staff? Stuart Eizenstat: No, I was on LBJ’s staff. But my office was directly next to Humphrey’s vice presidential office then in the executive office building. It was Carter who moved the vice president’s office into the West Wing. I knew all of Humphrey’s staff. I heard all of their stories. Stories Chris like, that Humphrey, the vice president of the United States sometimes spent 30 minutes outside of Joe Califano’s office, LBJ’s domestic advisor who was sort of my predecessor, waiting to go see him. The vice president was treated in a very backhand fashion. But I think the modernization is a good point and he modernized totally our transportation system. The efficiency that we have today is due to the efforts he did with trucking and rail and airlines, let alone telecommunications. Chris Riback: And what I’m not sure that many people realize is that he modernized the political campaign. In 1976, the nomination process for the Democratic candidate really moved in, I guess this was post-Watergate, one of the post-Watergate phenomena, but moved to a true nomination system. It was his, he made a 110 trips to Iowa in the two years prior to the opening of the campaign, prior to the caucus. Stuart Eizenstat: That’s a very good point. Up to that point in both parties the nominees were largely selected by party bosses in closed caucuses. Because of the so called McGovern rules, Carter understood in his brilliant campaign manager and later finally Chief of Staff, Ham Jordan, understood that this was a whole new ballgame. That party bosses were not going to control the nomination. If they had, Carter would never have been nominated. He also realized that Iowa which is after all only a caucus not a primary with 10, 15,000 people voting at all was going to have a disproportionate impact on who got the nomination. If he could be there first and often and get a boost then it would make a big difference. And so he did pay a 110 visits. He wife paid almost as many. His family did. And what was interesting is when the election results occurred through the caucuses, Carter was the winner over Mo Udall and Birch Bayh but you know what his winning percentage was? He had 27%. 60% were undecided and yet the headlines were, “Carter wins Iowa.” That propelled us into New Hampshire and the rest again is history. Chris Riback: Let’s go through, if we could, some of the points that anyone even from today, anyone who might have been born in the years since Jimmy Carter would surely know about and would want to hear about from you. I think first obviously has to be, there’s Iran, there’s Camp David and then I’d also like to understand a little bit about the crisis of confidence speech, the Malaise speech which you outlined and some of the ties then to politics today and Pat Caddell and all of that was just phenomenal and there’s so many connections between what you talk about, what occurred and Jimmy Carter presenting himself as really a more conservative Democrat and so much of that in an almost populism resonates today. But let’s start with Iran. What is your take? Was there anything with the benefit of hindsight, did President Carter do absolutely everything that he could? Is there something, anything that maybe in your conversations with him? Anything that could have been done differently? What’s your take on Iran? Stuart Eizenstat: Yes. Very critical frankly of the handling of Iran. And let me take it from the start. The CIA in 1953 had put the Shah back on his throne sort of overturning a democratic election there. Six presidents had given 10 of billions of dollars of our most sophisticated military arms to the Shah. He was our bulwark in the region. But the intelligence failure in Iran was massive and Stan Turner who headed the CIA told me in an interview that he felt that he had let the president down. So let’s look at those intelligence failures. The CIA did not know that the Shah’s domestic support rested on quicksand. That it had eroded completely. They did not know that the Shah for five years Chris, had been getting cancer treatment for a deadly form of cancer. They did not know that Ayatollah Khomeini in exile outside of Paris was sending provocative, radical consents back to Tehran to stir up opposition to the Shah and undo him. I mean this is just an unforgivable intelligence lapse. Number two, once the hostages were taken, Carter made two fundamental decisions both of which I disagreed with. Decision number one was to tell the hostage families that his number one priority was getting them back safe and healthy. Well that’s an understandable impetus but that tied his hands Chris, for taking more firm action militarily. That Zbig and I both recommended. Like for example, mining the harbors outside of Iran’s Kharg Island or blockading them to prevent oil from going out which was their only source of revenue. Yes, it would have risked to some extent the lives of the hostages but I think in the end if we showed that determination they might have released them. The second seminal decision was to hold himself up in the White House to show that he was working full-time on this. All that did is cause even more press attention and more public attention. Instead of going about his work and saying, “Yes of course this is important but I’m not going to let it haunt me.” He Chris, became a hostage himself in the White House. And if we look at the press, you’re part of it, because of the hostage crisis Walter Cronkite, CBS TV would sign off every evening broadcast by giving the number of the day of the hostage crisis. And then of course the abortive and disastrous rescue effort in the desert of Iran in which helicopters collided. It was not because of Carter. It certainly wasn’t his personal fault, but the fact is it was seen as a metaphor for the failures of the administration. Chris Riback: Then of course they ended up getting released the day that Carter left office and Reagan took over. Stuart Eizenstat: And I would say to his credit, we talked about his accomplishments, we suffered a massive election projection but if you look at the actual polls, up until the last weekend we had pulled even in some actually ahead and then he made a fateful decision. He was in Chicago, I was with him campaigning for the last weekend. I got a call at 3:00 AM from the White House operator, the president wants to leave in 45 minutes. We had gotten a new offer back from Iran on the hostages and I urged everyone not to leave the campaign trail. Look at the offer from there. It turned out to be a step forward but certainly not enough. So it just reminded everybody of what was his worst problem. And the polls then immediately just slid. But interestedly although we then lost in a landslide, he had what by any fair measure was the most productive post-election transition out. It was in that period that two and a half months before Reagan came in that the final negotiations were done on Alaska land as a lame duck, that the final negotiations were done and signed for the super fund bill to clean up chemical waste. That the final negotiations were concluded for the hostages. And it was during that time of what seemed at the time sort of humorous incident in which Senator Kennedy called me and said, “We’ve got a vacancy on the first circuit, I’d like President Carter to nominate Steve Breyer from my staff who helped on airline deregulation and Harvard Law School. And I said, “Senator, I know Steve he would be terrific but the president has no love lost towards you. He thinks that you’re race against him really helped undermine and divide the party.” And he said, “I know, that’s why I’m calling you.” So I went into see Carter and with my notebook of all the reason we should support him, I said, “Forget who asked this, there’s a vacancy on the first circuit, you know Steve helped us on airline deregulation. You know how brilliant he is as a professor at Harvard Law School.” And I didn’t think I had a chance of getting it done. He said, “I’ll do it. It’ll be a tribute to our administration and to the judiciary.” And that was an essential first step of Steve Breyer’s ascension to the Supreme Court. So all of these occurred Chris, after he was defeated. As a lame duck with an incoming Republican Senate awaiting him. Chris Riback: It’s a remarkable amount of things that got done in that period. I want to ask you about Camp David which quickly on the campaign which you just mentioned, when Reagan asked or you asked Americans, “Are you better off now than you were four years ago?” How did you answer that? How did you answer that for yourself? How did you answer that for the American people? Stuart Eizenstat: Well first of all as I lay out in the book and Jim Baker who was his campaign manager later Secretary of State and Reagan’s Chief of Staff, Secretary of the Treasury, they stole our debate book. They had our debate book. Jim Baker told me flat out that Bill Casey the head of the Reagan campaign plopped it down about 10 days before the date. So they knew all of our attack lines and they rejoined it very effectively. And the problem was Reagan’s question was right to the heart of our problem because it was in the midst of the high inflation. We had not yet had the benefit of Paul Volcker’s tough medicine. Growth had slowed again because of his tight monetary policy. So when he asked that question it was very difficult. As recited all the positives that I’ve just given you but it’s very difficult in one breath to give the kind of answer that would assure people. So in many ways the campaign against Reagan was run on the fear of Reagan as the unknown and the cavalry out of the west and so forth. That had actually had a positive impact on the electorate until that disastrous last weekend when he came back to deal with the Iran crisis. Chris Riback: Yes, we came back. I think you guys were in Chicago if I’m not mistaken. Stuart Eizenstat: We were in Chicago. Chris Riback: Yes. Camp David, obviously one of the highlights and in all sorts of personal ways for a significant for you and a lot of the issues that you’ve been personally involved in and your family’s been involved in for the last 40, 50 years. Tell me about that. What was that like? Stuart Eizenstat: Camp David was I think the most significant personal diplomatic effort ever performed by an American president. It brought the first peace between Israel and one of its Arab neighbors and at that Chris, it’s most powerful Arab neighbor with whom there had been five wars since Israel’s creation. He did it by pouring over intelligence reports on Begin and Sadat trying to understand them. He had personal touches like taking them to Gettysburg battlefield to remind them of the cost of war. He barred the press to block outside pressures from their home constituencies. But interestingly Chris, Sadat and Begin almost never met in the same room. They were like two scorpions. So Carter had to negotiate separately with them and with their staffs through 13 agonizing days and nights and more than 20 drafts that he personally wrote of an outline for peace. It was really an exhausting effort. But the last Sunday, the 13th day when everybody decided that there was going to be no agreement. Everybody was going home. He had still fallen short because Begin said, “I can’t make any further concessions. I have my bags packed and I’m ready to return.” And this was not a bluff. The cars were already ready to take him back to Washington, Camp David. Carter saved the day with a really novel personal touch. Knowing because of studying the intelligence reports of his love of his eight grandchildren, Carter personally signed photographs individually to each one of himself, Begin and Sadat and then walked them over to Begin’s cabin at Camp David, handed it to him and then as he described to me, saw Begin’s lips quiver, his eyes tear, Begin put his bags down and said, “Mr. President I’ll make one last try.” And the rest is history. That treaty remains in effect. It’s never been violated. It’s central to Israel’s security and to America’s national interest in the Middle East. Chris Riback: That was remarkable time. And your telling of that in the book is extraordinary. It brings me to today and just to close out, Carter’s legacy and how do you define it and relevant directly to today, how do you see it being impacted and maybe putting this just as directly as possible, do you feel in any ways that Trump is destroying it? We often think of Trump going after Obama’s legacy but in your book go through the things and you went through it at the top of this call, Carter’s legacy of human rights at the center of our foreign policy. Of environmental action particularly what Carter did around national parks. Race relations which we really didn’t even get to talk about in this conversation but you talked about it a little bit with Carter’s speech when he became governor. Stuart Eizenstat: You know he appointed more African Americans and more women to judgeships and senior positions in the administration Chris, than all 38 presidents put together before him. Chris Riback: Wow. It was extraordinary. You outline in the book his relationship, friendship with the first black midshipman to graduate, Wesley Brown. Not joining those racist business groups in Plains. His vote at Plains Baptist Church to admit blacks. You go through there’s so much in the book where you document. Yes, you just mention that fact but through his history. His history on race relations but those aspects of, and the other legacy of Carter that I felt in reading your book, really rings in today’s times, his famous line to the American people, “I will never lie to you.” How are you viewing Carter’s legacy and what’s your sentiment towards what you see happening today? You do see a dismantling of some of Carter’s legacy? Stuart Eizenstat: Well clearly I’ve been working on this book on and off for 40 years with the 5,000 pages of contemporary notes and 350 interviews so I didn’t write it as an anti-Trump piece. But I think the contrast in so many areas is really strong. Carter behaved like a president, he respected the office and the institutions, the justice department, the FBI. He made government reach higher ethical level. Many of those still in effect, the Inspector General, the ethics laws and so forth. But I think really it was valuing the presidency as a place for the highest values in the country. For treating all our citizens equally. For human rights abroad. For protecting democracy and peace abroad. When I travel and I travel very widely in the Clinton administration I was ambassador to the EU and under Secretary of State, the treasury secretary and so forth, the country is viewed in remarkable ways. Not like it was before. I think that the contrast is very much there. And I hope we can get back to some of the same values. That is not to say he was a perfect president, again I’m very, very blunt on saying that his major problems were inflation, Iran, the inexperience that he brought to Washington and that of his Georgia mafia, the inter-party warfare with Kennedy. I don’t whitewash any of these. What I’m trying to do in this book is present an overall view that puts the successes and the lasting accomplishments into that context that have not be obscured by some of the problem. Chris Riback: Stu, thank you. Thank you for your time. Thank you for the book that you wrote and most obviously for your service, years of service to our country. Thank you on all fronts. Chris: Stu, you write about it in the book: Why do you think Ted Kennedy ran for President in 1980? Stuart Eisenstat: Let me say at the beginning that I had an extremely close relationship from beginning to end with Senator Kennedy. He called me after the election to ask that his aide, Stephen Breyer, be appointed to the to the First Circuit Court of Appeals. But I think what happened was he saw Carter as a block to his carrying a legacy of his fallen brothers. Carter was too conservative for him. He wanted full blown cradle-to-grave federally funded National Health Insurance, which was totally unrealistic. In the political climate we were in where there had been eight years of Republicans before, there would be eight years afterward. Carter understood that we were in a conservative era. He was very cost-effective. Now we put in a first phase National Health Insurance Program, that was a major, would’ve been a major benefit covering all kids, catastrophic care and so forth. But I think that he was pushed by his liberal wing and he was pushed by, now this may have been his last chance to in effect, follow his fallen brothers and take over the White House. He saw Carter as being unpopular. He thought he’d be an easy pushover. He thought the liberal wing of the party, the labor and liberal wing would propel him to the nomination and it would be easy pickings. It’s a shame because he had every right to run. But as a Democrat, he certainly had an obligation if he was going to run and I think running against your own President is a very tough thing. But if he was going to do it, he could at least have reconciled afterward and as I show in the book, he distanced himself at every possible way as if to say, it really doesn’t make a difference if Reagan or Carter is re-elected,which was incredible. He had had a strong record of support for many of our legislative initiatives, and that show it in the photograph in the book, that most distant handshake. Instead of the hands clasped which traditionally is the case at the Democratic Convention, said it all. He hardly campaigned. When he met Carter after the Convention, he was more interested in our picking up his debts than really picking up the mantle of the party and running. He could’ve helped rally the liberal wing of the party and he didn’t and that’s a shame. I think he’s a great Senator. He became even greater thereafter. But, I think he just showed to me very, very bad judgment in not supporting Carter – at least in contrast to Reagan.